BACH'S MAGNIFICAT AND CANTATA '140 will be performed by Voces Intimae, with full orchestra, at 7:30pm on Sunday, Nov. 24th, at St. Mary the Virgin Church, 1701 Elgin Rd, Oak Bay. Soloists will include Colleen Ball, Eva Bild, Stephanie Landucci, Paul Boughen and Josh Lovell. Tickets $25 and $20. For more info. 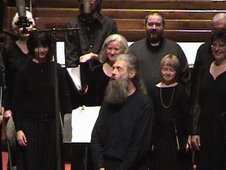 vocesintimae@shaw.ca or 250-727-2529. At 8:00pm on Friday, October 18th, at St. Aidans United Church, 3703 St. Aidans Street, Victoria, 3 of Victoria's favourite choirs: the CBC award-winning Balkan Babes, the Victoria Doukhobor Choir and Voces Intimae will perform folk music from the Balkans, Russia, England and Ireland. Also on the programme will be the band 'Jamshed' performing works from the around the world, including Hungary, Rumania and Argentina. For more information vocesintimae@shaw.ca or 250-727-2529.
advance at Ivy's, Larsen's Music and Long & McQuade. Proceeds to the Green Party. The MEN of 'Voces' will perform a concert of Russian Orthodox music by Bortnyansky, Golovanov and Chesnokov, and secular music by Schubert, Sibelius and Chaikovsky.Featured Soloist: Alto - Erin Ronningen. Tickets $15/$10 at the door. Sun., Jan. 16th, 3:00, St. Mary's Elgin St in Oak Bay. 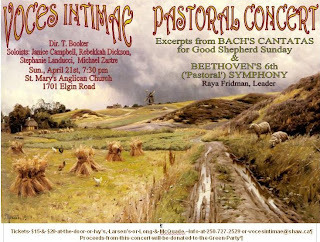 VOCES INTIMAE will perform excerpts from Bach's Cantatas for Epiphany with string quartet, oboes, french horn and continuo. These cantatas contain musical gems equal or surpassing the brilliance of Bach's more frequently performed choral works. Also on the programme we feature arranger and woodwind player Rainer Roth, who has performed many times with Voces. He and Prof. Patricia Kostek from U.Vic's School of Music will perform Bach's C minor double concerto (originally for oboe and violin) arranged for 2 clarinets. A very rare opportunity to hear Bach played on clarinet! Tickets are $15 and $20 at the door or in advance at Ivy's, Larsen's and Long & McQuade. For information call 250-727-2529 or email vocesintimae@shaw.ca. On Sunday, February 3rd at 3:00 pm at the Ukrainian Church of St.
For further info. call 727-2529, or email vocesintimae@shaw.ca. VOCES INTIMAE will be presenting a concert of SLAVONIC SACRED MUSIC at 7:30 pm, Sat., Jan. 27th at St. Nicholas Ukrainian Catholic Church, 1112 Caledonia Avenue, Victoria, BC. 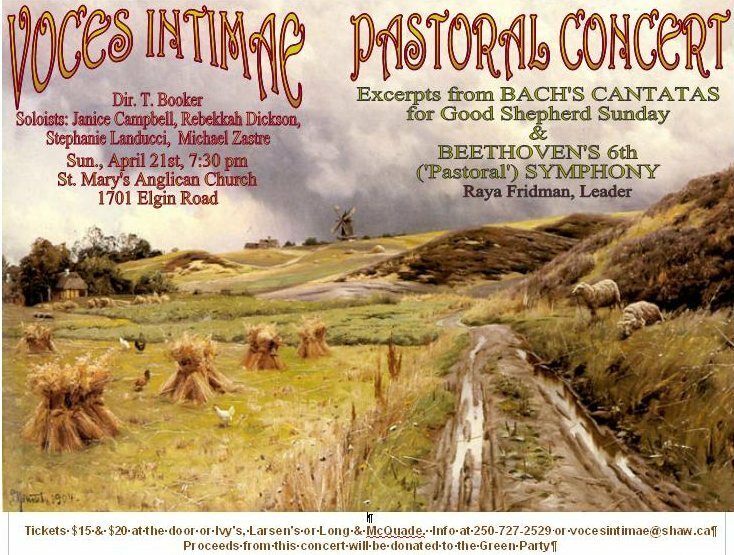 This is VOCES INTIMAE'S 6th concert devoted to Slavonic Church music. In the past it has confined itself to masterpieces of the Russian Orthodox Church, such as the Rachmaninov 'Vespers' but this year will be including choral music from the Ukrainian and Bulgarian liturgical repertoire. With the experience in singing Slavic music gained over the last five years under the direction of TONY BOOKER (a post grad student at St. Petersburg Conservatory) you can be sure that VOCES INTIMAE will provide you with a wonderful choral experience. alto, Kim Greenwood and tenor, Doug Sharp. Tickets are $15 and $20 available in advance at Ivy's, Larsen's and Long & McQuade, or at the door. Also available, for $40, at the door, or in advance by contacting us at vocesintimae@shaw.ca, are Season Tickets for all three of VOCES INTIMAE'S 2007 choral concerts. VOCES INTIMAE'S repertoire over the last 10 years has ranged from Okeghem to Coldplay, with an emphasis on Slavonic music and the cantatas of Bach. We perform 3 concerts a year. A month before each concert interested singers get together and set up a schedule of 6-8 rehearsals that suit all those involved. There are no membership fees; in fact, any profits from each concert are shared equally between singers, conductor and secretary.